This new DVD tells the story of the King's Lynn Stars, covering the period from 1965 until 1990. The club was launched in an attempt to mop up disenfranchised Norwich fans and even adopted the same nickname and colours to suggest some form of continuation. Over the years that followed the club established its own identity and were ever present members of the British League. Original promoter Cyril Crane is now into his eighties but he looks lively and switched on in the interview he gives. His partnership with Maurice Littlechild lasted until Maury's life was cut short. Terry Betts recalls that Maury and Cyril were always a bit of an "odd couple" promoting team, though undeniably an effective partnership. Betts (still the ultimate King's Lynn legend) features heavily on the DVD. His own career is covered in detail, with Terry and his former colleagues and bosses sharing their memories. Terry is also well placed to comment on the general history of the club and the great riders who have worn the Yellow and Green body colour. Malcom Simmons is amongst these and his rivalry with Betts is touched upon. Simmons (who died earlier this year) was interviewed and recalls his frustration at living in Betts' lengthy shadow, a frustration that ultimately led to his move to Poole. Cyril Crane gives the impression that he often found it difficult to deal with Simmo and perhaps wasn't too sorry to lose his services. Another big favourite in those early days was Ian 'Tiddler' Turner. Turner was one of those small and spectacular riders in the mould of Peter Craven and Billy Bales. He admits that when he first signed for Lynn he had no expectation of actually getting paid, he just wanted to ride his motorcycle. Throughout his career he could undoubtedly have made more money, but he seems happy to have received a decent wage for doing something he loved. He admits to a slight embarrassment that Michael Lee (who reached heights Ian could only dream of - in every sense) names him as his boyhood hero. 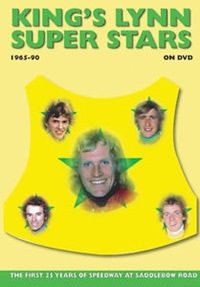 Martin Rogers was involved with the Stars (in various capacities) throughout much of the era the DVDs cover. The interviews he gives are always honest, interesting and enlightening. His ability to recall detail from many years ago is most impressive and he wears his love of speedway on his sleeve. It seems a real pity that his expertise has been lost to speedway for so long. The DVD is cleverly edited to allow the same story to be told from different perspectives. In particular the stories behind the departures of Terry Betts, John Louis and Michael Lee are all subtly different in the versions told by Rogers and the riders themselves. Many years have passed since these events but there are clearly still some unresolved tensions. Lee made his name at King's Lynn and was crowned World Champion while he was riding for the Stars. He'd grown up as a Stars fan, idolising 'Tiddler' Turner from the terraces, so his tale should have been real 'Roy of the Rovers' stuff. Sadly, that's not how he's best remembered. Martin Rogers elected not to retain his services when he became promoter, but subsequently signed him a couple of years down the line when he needed to beef up his team. By that time Lee's behaviour was increasingly unpredictable and he couldn't be relied upon to honour his bookings. Rogers and Lee are both intelligent and articulate men and look back on those times from their different perspectives. Rogers eventually sold the club (via a PO box number and an advert in the Speedway Star) to Malcolm Simmons and Bill Barker. Simmo's involvement only lasted one year, he says mainly due to financial losses accrued in paying over-the-odds to over-the-hill Bo Petersen. Barker continued to run the club thereafter but the financial stability of the Crane and Rogers eras had gone. Thankfully the club eventually fell into the hands of Buster Chapman who has steered a steady course for many years. Retro-Speedway have now produced a number of DVDs featuring individual clubs, but this is quite possibly their best one yet. It's difficult to think of any of the surviving key players who aren't interviewed. The DVDs run to six hours but never outstay their welcome. There's no sense of padding or duplication, it all moves along at a good pace and fully justifies the running length. Despite the increased running time, the DVDs retail at their standard price of £16. Excellent value indeed.